Everyone wants to save a buck. According to a study, many U.S. companies save on taxes by shifting profits overseas. That’s a problem for the United States because our government thus misses out on that revenue. It’s a growing problem. In the report, “Profit Shifting and U.S. Corporate Tax Policy Reform,” published May 10, Kimberly A. Clausing starts with acknowledging the fact that the current corporate tax system is broken. “The United States has one of the highest statutory corporate tax rates among peer nations, yet we raise comparatively little corporate tax revenue as a share of our gross domestic product, or GDP.” She calls the system “incoherent” and says that this results in unfair tax treatment for companies, depending on how they’re organized. In practice, big U.S. multinationals get away with tax dodging. 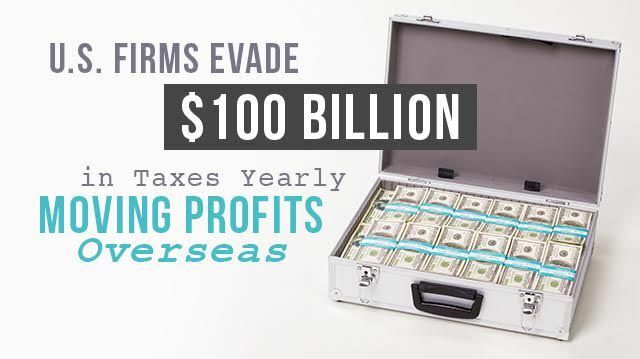 · U.S. multinational corporations reduce federal tax revenues by more than $100 billion annually through profit shifting, moving money to arms of the company in countries with lower tax rates. · Profit shifting to countries where corporate tax rates are less than 15 percent accounts for about 98 percent of the revenue loss. Profit shifting to just seven “tax-haven countries” accounts for 82 percent of that. · At home, we have seen a fivefold increase in revenue loss due to profit shifting over the past decade. The seven tax-haven countries Clausing referred to — Bermuda, the Cayman Islands, Ireland, Luxembourg, the Netherlands, Singapore and Switzerland — have a less than 5 percent effective tax rate. For corporations, the effective tax rate is the “average rate at which its pre-tax profits are calculated.” By shifting their profitable divisions overseas, companies thus save millions. Analyzing data from the U.S. Bureau of Economic Analysis focused on U.S. multinational firms, Clausing found that $77 billion to $111 billion in corporate tax revenue was lost in 2012 alone. This year, the Treasury Department will lose out on an estimated $94 billion to $135 billion. As a way to combat profit shifting, Clausing suggests incremental reforms that would allow businesses to adjust to a new way of doing business. She recommends “repealing check-the-box regulations that facilitates income shifting; tougher earnings stripping laws; [and] anti-inversion rules such as an exit tax.” An inversion is when a U.S. company merges with a smaller foreign company in order to acquire its lower tax rate. Income shifting often is done through the assignment of patents to low-tax overseas subsidiaries. Inversions are done through the merging or buying of smaller foreign companies and moving the company’s headquarters overseas where there are also — you guessed it — lower tax rates. An exit tax would charge U.S. firms for leaving home, discouraging the practice. Business groups and corporations complain that the current tax rate is too high, but it seems clear that many companies have figured out a way around that. Most multinationals aren’t paying taxes at our corporate rates anyway. Predictably, corporate tax rates have factored into the 2016 elections: the Republicans are largely in favor of lowering corporate tax rates while the Democrats are at least passively for raising them. Perhaps we’ll see reform in the coming years, but one thing’s for certain — thanks to Clausing’s report, a much-needed conversation is happening. Hey Buddy!, I found this information for you: "U.S. Firms Evade 0 Billion in Taxes Yearly Moving Profits Overseas". Here is the website link: https://www.thealternativedaily.com/u-s-firms-100-billion-taxes-yearly-overseas/. Thank you.